River Nile is an adventurers dream. It takes players on a memorable journey down the lucky waters on an unforgettable journey in search of Pharaohs fortune. River Nile Casino is part of the famed group, Vegas Partner Lounge, which has built a great reputation for itself over the years, When you sign up to the casino you will receive unbeatable service, a huge game selection and some exciting bonuses and rewards. Licensed and registered under Maltese law with the Lotteries and Gaming Authority, River Nile adheres to a strict code of conduct. With the eCOGRA seal of approval under its belt, players can rest assured that all gaming activity in the casino is fair and reasonable. 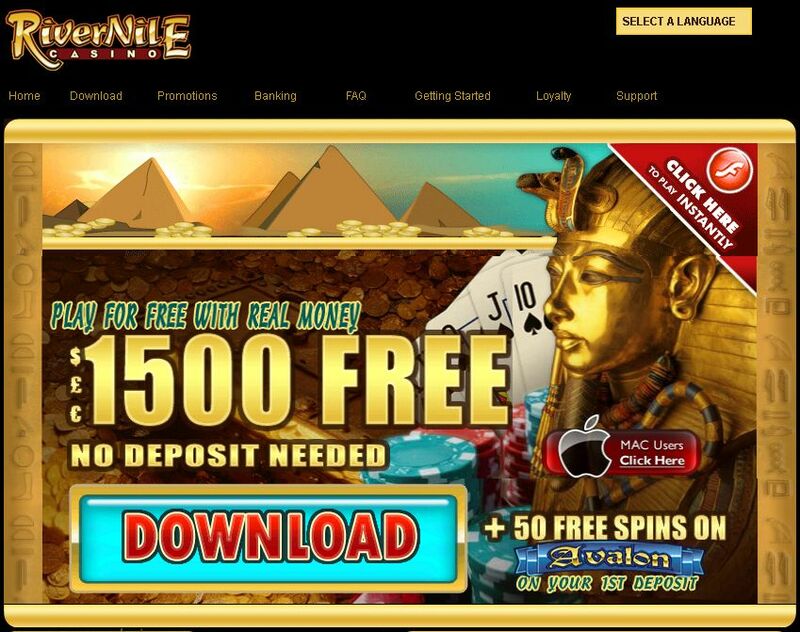 River Nile Casino is a leading online casino and is a unique blend of variety and convenience. They strive to provide a gaming experience that is beyond superior, and aim to create an exciting casino atmosphere for their players to enjoy. It is a well-rounded online casino for players who are serious about winning. Powered by Microgaming™, the leader in online gaming software, River Nile boasts of high quality online games that have the astounding graphics, unique and fascinating themes as well as some fun features that will boost your chance of winning big. These games are available either in the Instant Play Flash version of the casino, or can be downloaded. Downloading the casino is the best option because the variety of games is broader and you will be able to access the casino straight from your desktop to play with convenience. The downloading process is also simple, quick and easy. With over 600 games to choose from, players at River Nile Casino are spoilt for choice. It is always difficult to choose which games to start with when there is such a large number to pick from, especially when there are new games being added to the mix monthly. The Video Slot selection is unbeatable and can be enjoyed by everyone, whether first-timers or experienced players. There are also Progressive Jackpots, Table Games, Video Poker, and Unique Parlour Games. The games are guaranteed to leave you feeling full and satisfied. River Nile Casino offers an unbeatable welcome package that reflects the generous nature of the casino. Players can choose a bonus that suits them best, either the FreePlay offer or the 200% Match Bonus. If you are new to the gaming world, it is probably wise to opt for the FreePlay, where you get $/€/£1,500 on the house to play with for 60 minutes. Any winnings you make during this time are yours for the taking. If you consider yourself more of a gaming veteran, you can choose the 200% Match Bonus offer. When you make your first deposit of up to $/€/£25, you will receive an additional $/€/£50 absolutely free. That means you get a total of $/€/£75 to win with. 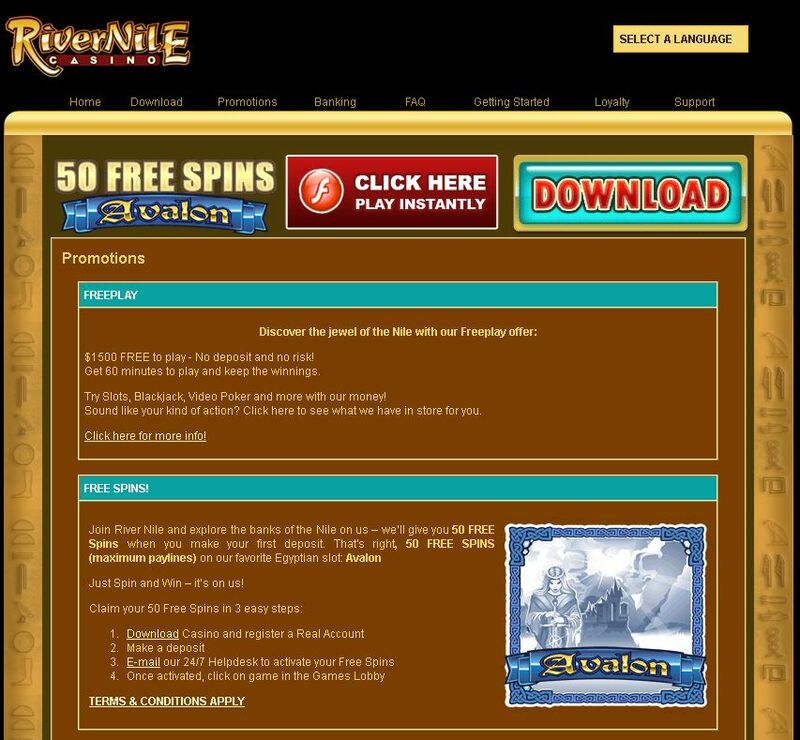 River Nile Casino will also top you up with 50 Free Spins on the age-old mythical Video Slot, Avalon. There are a variety of promotions, tournament and competitions always on the go at River Nile Casino to spice things up. There are great rewards on offer every month and players can also work their way up the 4-tier Loyalty Ladder when they join the Vegas Loyalty Lounge Group. Here players can receive additional benefits which will better their gaming experience and send them skyrocketing towards winnings faster. The more you play, the higher you will move in the program; and the higher you go, the more benefits you are eligible for. Customer support at River Nile Casino is great. The Contact Centre team is friendly, efficient and on top of all current casino activity. They will help you with any query you may have whether it is regarding problems you are experiencing, bonus eligibility or casino promotions. They can assist you at all hours of the day, seven days a week in a variety of different languages including English, German, Dutch, Russian, Italian, Spanish and more. They can be contacted through a variety of different methods such as toll free numbers (available in certain countries), email, or through their efficient Live Chat service online. River Nile Casino gives you the liberty to play in a number of different currencies such as the US Dollar, The Australian Dollar, the Canadian Dollar, the Euro, the Pound and many more. All transactions are carried out in a secure environment over 128-bit digital encryption software, and they comply with the industry security standards. River Nile accepts a number of payment methods including Credit cards, Debit Cards, Click2Pay, E Wallets, wire transfers and many more. This casino is about convenience and you can check out some more of their banking options on their website under the banking tab.